Lida Quillen is an author, editor, literary agent, publicist and web master. She is the founder and owner of cyber book shoppe and publishing house Twilight Times Books as well as the Twilight Times Agency and Twilight Times ezine. She shares the knowledge and experience gleaned from her internet endeavors in her latest non-fiction book, Practical Tips for Online Authors. News! Lida is pleased to announce an upcoming release. Practical Tips for Online Authors Revised for 2003 edition. a guide for writers on the web. eBooksOnThe.net in PDF, RB, PDB, HTML or LIT formats. Secure shopping cart. Twilight Times Books in PDF, RB, PDB, HTML, hiebook and LIT. Writers-Exchange in PDF, RTF and HTML. 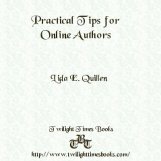 "For new authors, or published authors uncertain how to use the internet to grow their careers, Lida Quillen's Practical Tips for Online Authors is a useful resource packed with timely information. ...Filled with enthusiasm and solid knowledge, Practical Tips for Online Authors is a must read." Read the complete review of Practical Tips for Online Authors by Cindy Penn of Word Weaving. "...You'll find timely tips from bestselling authors and professional explanations for everything you will ever need to succeed in online publishing. Run, don't walk, to buy this book! You'll be glad you did." "...the information for unpublished authors is a treasure trove...saving you countless hours of Internet time trying to network and find the sites to help you in your quest to get published. This book is a must buy for writers!" "At this price, you can’t go wrong even if you are only curious about writing. Lida is the Publisher of Twilight Times Books, so she knows her topic from first hand experience, so you can be assured that this is a well thought out volume. Highly recommended by Baryon." Reviewed by Barry Hunter for Baryon Online. "While unabashedly geared for the "prepublished" ebook author of speculative fiction, much of the advice crosses genre boundaries and proves useful to writers aiming for traditional print markets, as well. In fact, with the Internet becoming a major force in the world of book marketing, authors at all rungs of the literary ladder of success will benefit from this handy and well-organized reference. The hypertext references make it easy to skip to specific topics within the book...."
Reviewed for Crescent Blues by Kim D. Headlee, the author of Dawnflight, a novel about the legend of Guinevere. Read the complete review of Studies in Genre by Cindy Penn of Word Weaving. "If you are a writer or want to be a writer and want to try and understand the way creativity works-buy this book. It's a fascinating read!" Read a review of Studies in Genre by Jewel Dartt of Midnight Scribe Reviews. Visit Twilight Times Books and check out the freebies page. Copyright © 1998, 1999, 2000, 2001 & 2002 Lida E. Quillen. All rights reserved. This page created and maintained by Lida E. Quillen. This page last updated 11-16-03.